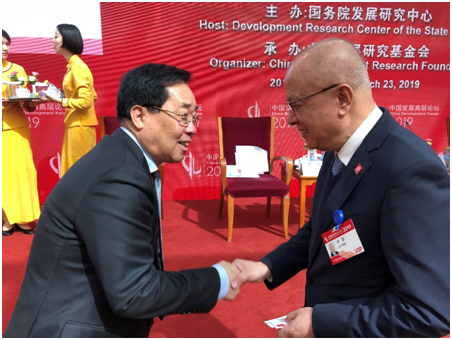 On March 23, 2019，SRCIC Vice Chairman and Secretary General Li Zhonghang attended China Development Forum (CDF) 2019, hosted by the Development Research Centre of the State Council (DRC) and organized by the China Development Research Foundation (CDRF), at the Diaoyutai State Guesthouse in Beijing. Themed with Greater Opening-up for Win-Win Cooperation, the CDF is committed to Engaging with the World for Common Prosperity. It is the first national-leveled international conference after the Two Sessions in China, namely the National People's Congress (NPC) and the Chinese People's Political Consultative Conference (CPPCC) which provides a platform for the Chinese government, global business community, multilateral international organizations and academia to enhance exchanges and to promote dialogues. Chinese Vice Premier of the State Council Han Zheng attended the opening ceremony and delivered a speech. 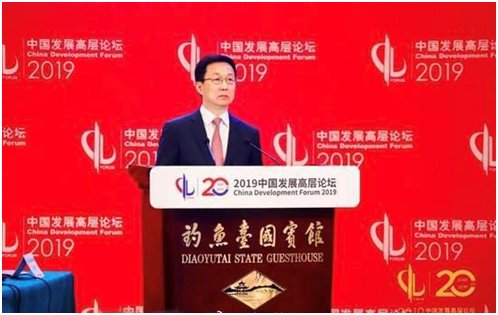 Ning Jizhe, Deputy Director of the National Development and Reform Commission of China, Liu Kun, China's Minister of Finance, Yi Gang, head of the People’s Bank of China also gave the speeches at the CDF. More than 150 international representatives attended the forum including 96 executives from Fortune 500 companies and global industry leaders, and nearly 30 internationally renowned scholars. At the forum, SRCIC and CDRF had an in-depth exchange of views on strengthening exchanges and communication in the future and establishing a working contact mechanism.